President Edgar Lungu has wound up his business in Addis Ababa in Ethiopia following the close of the 24th African Union summit last evening. 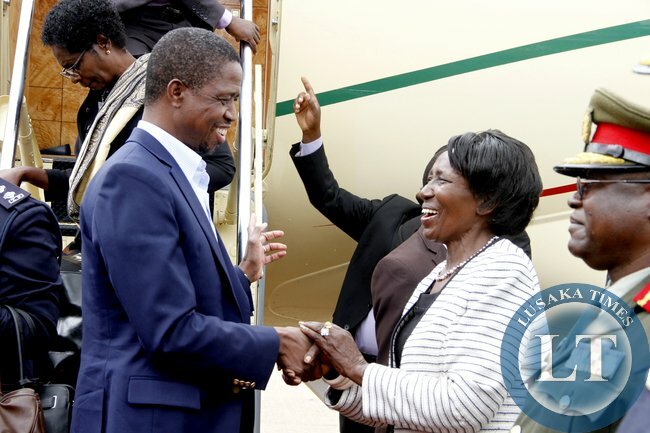 His Presidential Challenger plane left Bole International Airport at 08:20hours local time in the company of First Lady, Esther Lungu and his Special Assistant for Press and Public Relations, Amos Chanda. While in Addis Ababa President Lungu attending the 24th African Union summit which ran from January 30th to 31st, 2015. Mr. Lungu also held bilateral talks with Presidents and Prime Ministers from within Africa and beyond. He also held talks with the Chairperson of the African Union Commission, Nkosazana Dlamini-Zuma, United Nations Secretary General Ban Ki Moon and Unite States of America’s Assistant Secretary of State Linda Thoma-Greenfield. Meanwhile, First Lady Esther Lungu described the Organisation of African First Ladies Against HIV/AIDS (OAFLA) meetings which she was attending as an eye opener and fruitful. 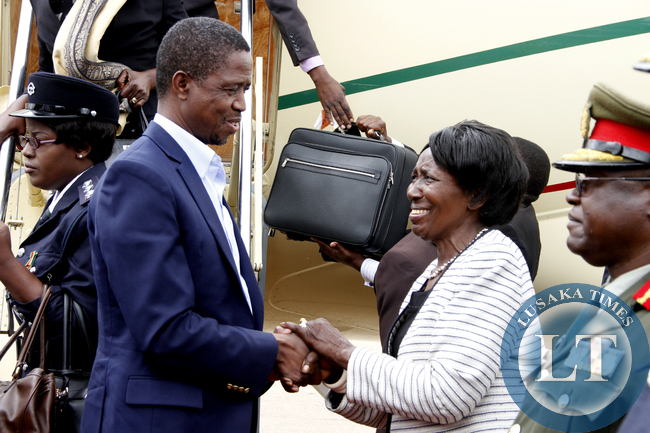 Mrs. Lungu said the meetings presented her with an opportunity to interact with other African First Ladies. She told Zambian journalists in Addis Ababa that she learnt a lot from the summit on HIV/AIDS, cervical and breast cancer and other disease that daunt the African continent. She said she will utilise the knowledge to help vulnerable people in Zambia. And Mrs. Lungu has observed that the provision of basic needs to rural families would help reduce cases of defilements, child marriages and gender based violence. She said girls who cover long distances to fetch water and firewood were prone to abuse by men. 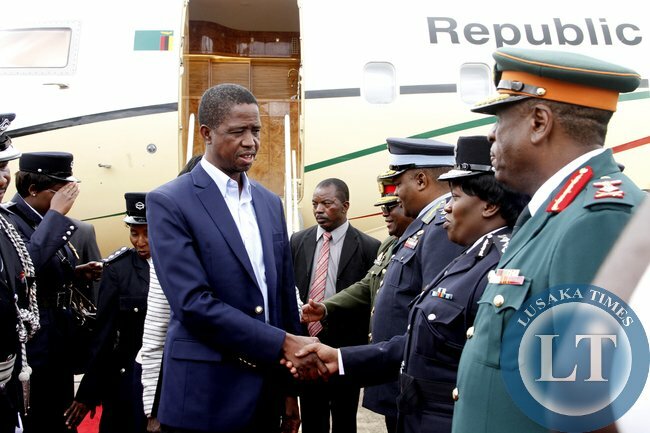 Meanwhile, President Edgar Lungu has said African leaders have shown a lot of commitment and genuineness towards improving the economies of their countries. President Lungu said after a close contact with other heads of state and government at the just ended 24th African Union summit in Addis Ababa, that he has realised that the leaders of various countries in Africa genuinely desired to improve their economies. He said as he described his experience at the summit that his government will right away work towards developing the country. The President was talking to Zambian journalists today shortly before he left Ethiopia for Zambia. He said the theme of the 24th AU summit, which is ‘2015, year of women empowerment and development in Africa towards agenda 2063’, suggests that there was no time to relax for him and his administration. 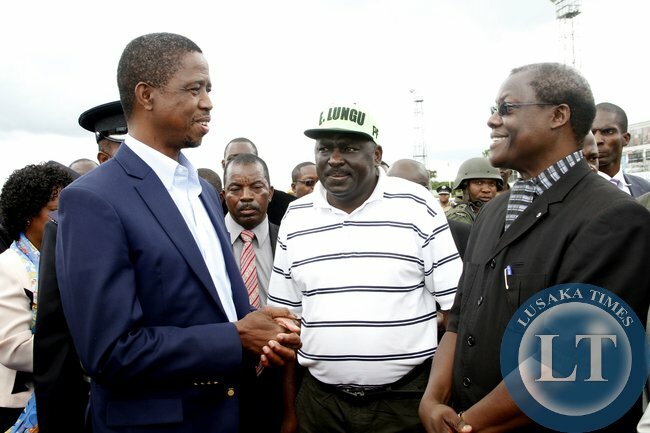 And President Lungu has stressed that integrating with regional economic groupings and countries was important for accelerating economic and social development in the country. He noted that Zambia will therefore continue to cooperate with regional groupings such as the Southern African Development Community (SADC) and other bodies towards development. While at the summit, the President held closed door meetings and bilateral talks with leaders of different countries and groupings. 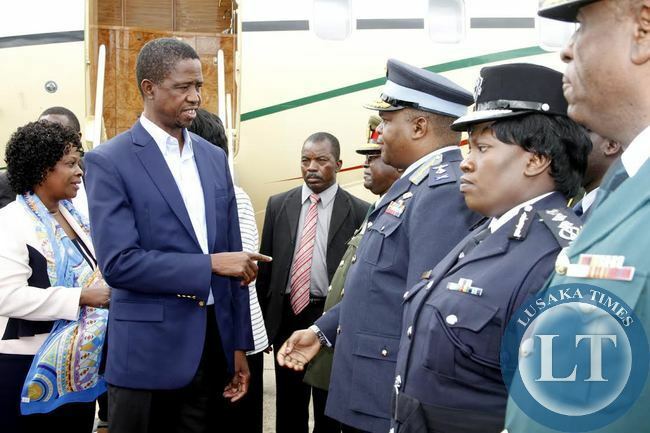 Meanwhile, President Lungu has urged media heads in Zambia to run their institutions as a business in order to redeem them from financial difficulties. He said although there was bureaucracy in government media institutions, public institutions such as the Zambia National Broadcasting Corporation (ZNBC), Zambia Daily Mail and the Times of Zambia should isolate themselves from bureaucratic procedures. He pointed out that by isolating themselves from bureaucracy and by having good managers, public media institutions will run as viable business minded companies. The President also urged the media to be innovative by exploring new business ideas that would enhance their operations and profitability. “For me, I will let the media run as businesses to try and improve,” he said in answering a question on what his administration will do to address financial difficulties which public media institutions in Zambia were faced with. President Lungu has also urged journalists to use palatable language when talking to their sources so that they do not become hostile. “Let us be temperate when talking to other people as media. Let us use sober language,” he advised. 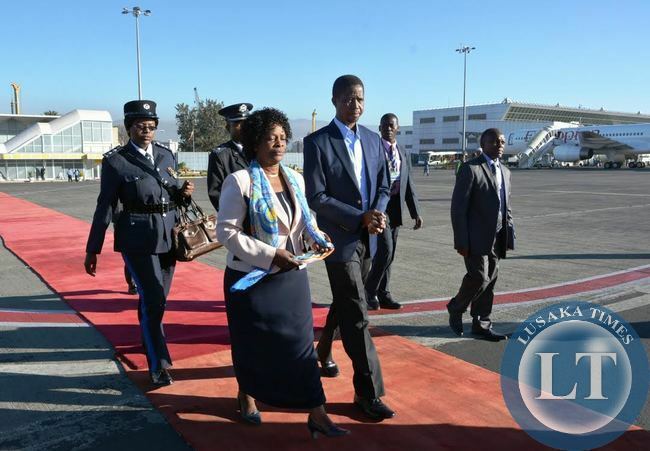 President Edgar Lungu and First Lady Esther leave for Lusaka after attending the 24th African Union summit in Addis Ababa, Ethiopia. Welcome EL our president for all Zambians. That Davies Chama has misunderstood the job of Pf secretary general. He is thinks a Party secretary should work like Kabimba did. Walking on RED carpet, and briefing the president on who should be ministers. Mambilima is now chief justice, replacing chebesakunda. I smell a HUGE RAT here, don’t you folks? Any way no surprise as it was expected by some us when I said a purge will follow once Lungu wins. RB is the chief consultant to lungu. Soon RB ‘s case will be confined to the dust bin and his son henry returned to Zambia to become a board member of one of the parastals. Lungu is a proxy for Mugabe, via RB. Things will move very quickly to appoint RB as vice president if Inonge ‘s appointment does not improve Lungu ‘s ratings in western province. RB is at work dismantling PF bit by bit. Remember it RB who sourced the money for campaigns from Boko Haram. Bena bazanya manzi under Lungu. Ife tili zee na HH and UPND. I agree. The following was reported by tumfweko “Rupiah Banda is not a member of the Patriotic Front and we don’t expect to see him in our Cabinet, says agriculture minister Wylbur Simuusa. And PF secretary general Davies Chama wonders how Banda can accept a lower position when he served the country as Republican President. Simuusa, who is also Nchanga PF member of parliament, said Banda’s support for PF presidential candidate Edgar Lungu was decided upon by the two men without the party’s involvement. I LIKE THEIR PHRASES. THEY CARRY WITH THEM VERY EFFECTIVE AND VERY DAMAGING MESSAGES TO THE PEOPLE AGAINST THE OPPONENT. TETI WINE. JUST IMAGINE THE, “DOMCHI KUBEBA”, PHRASE. SURELY, PEOPLE ATE PEOPLES’ MONEY KNOWING THEY WILL NEVER VOTE FOR THEM- MMD. THESE ARE CLASSIC PHRASES AND WILL GO DOWN IN HISTORY. Esther – Ka mwana ka Munsenga kana malango!! Now first lady, eat your hearts out haters!!!! 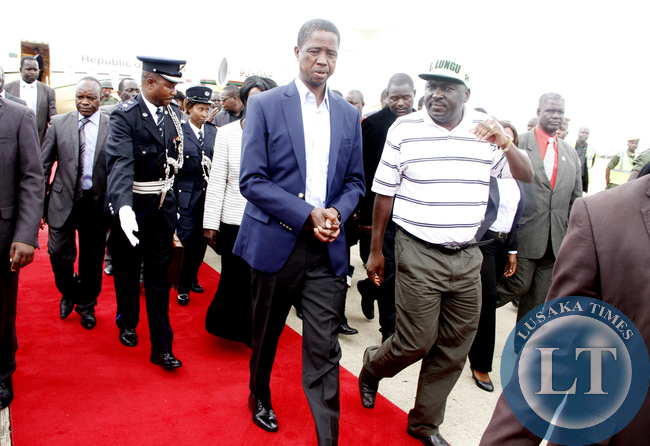 There is something “wrong” with Edgar Lungu which I hope I will try to highlight in my “tweet” words. In psychology, the nonverbal gestures speak volume of the character of a person. Gravitational and pivot laws are the simplest scientifically proven residual norms that naturally act upon each and every single individual regardless whether you’re GBM or Edgar Lungu in your skeletal make up. ……. self-massage or pacify his palms. The fraudulent rise to the corridors of power will always be a cancer to his premiership. From the panga wars of Kabwe as an opposed candidate out of the possible nine to the allegedly doctored votes of the 20th last, galvanises the reasons of insecurity and circle closing of hands. With time though, a chameleon is always identified in its surroundings. Yes the big man is back !! It is now time to get back to serious work. HE IS GOING ON HOLIDAY FOR A WEEK. HE IS NOT IN HURRY! Surely do we need this Presidential Challenger Jet? He could have easily connected to Lusaka via Ethiopian airline. ..if only we would find out how much was spent on fuel, Airport Parking fees and maintenance year this plane secretly flying sick old man Sata. As for the government media ie Times and Daily Mail when are you going to get rid of them…stop politicking…government has no business in keeping them. @Jay Jay, foolish thinking, you expect the president to take Ethiopian airline, senseless. its only a jet one day they will have their own. So you are saying when you become a president you will be flying public airline. I can’t believe you could think like that and post such comment for everybody to ready that. Yes we can tell the level of education from such comments. Cut the crap! Executives in huge conglomerates fly corporate jets. Like it or not EL is the CEO of the Zambian Enterprise and he deserves that plane. In fact, his colleague the CEO of the United States of America flies in a huge corporate jet called Airforce One. It’s a Boeing 747-200 with four engines, talk about the expenses involved let alone it’s carbon footprint. Why don’t you ask Obama to fly commercial next year when he comes to pay a state visit to Zambia meet with EL at the State House? Zambian Enterprise is funded by poor taxpayers..!! A monkey is a monkey. Take it from Northern province and bring it to the copperbelt, central or Lusaka pronvince it will still remain the same brainless monkey. Stop monkeying you monkeys !!!!!!!. You must really be one of the dumbest humans ever to have set foot on this big blue planet. The big blue marble. Welcome back mister president, you don’t need all those cheerleaders is all you needed to type. Stick to the topic and not insults, we know you are European. There is a bunch of 1diots lurking behind computer screens who get off on tribal acrimony. They are saber rattlers masquerading as Bemba, Lozi, or Tonga. They cannot live in a Zambia devoid of tribal conflict and they live to fan it up. They are so full of sadness and vile! They wanted HH to look bad in the eyes of the Bemba speaking people even as his biggest rival in the just ended elections was not Bemba. I have news for you: I am Bemba and I will continue to support HH because he has the right message! Now eat your heart out tribalist Mweemba7777! Let’s smoke out these enemies of progress. Let’s put their names on Zambia’s Hall of Shame. Enough is enough of this tribal garbage! Truly a hateful chap! Your fortunes will keep dwindling as lon g as you carry around your negative feelings and hatred for others. Actually your hatred is a cancer which will lead to your body getting diseased. All hateful people suffer from emotion debilitating toxins that escalate to lead to painful illnesses of the physical body. watch out! Now we want the full cabinet line-up so that your government starts working. Lets do a Bemba count on full cabinet line-up ! Bodman stop! The Bembas have been caught of side by President Lungu. Never in our history has our government had no Bemba at the top second. Lungu has done this and has given us a front row from around Zambia, Lozi, Nsenga, Kaonde as his operational first three :). One Zambia one Nation under Jesus. Wina chimubaba! Zambians are not foolish. They know how to punish those that steal from them! Viva, Zambians! Viva EL! 2016, it is still EL!!!!!!!!!!!!!!!!!!!!!!!!!!!!!!!!!!!! Surely what type of Army Service Chiefs are these who spend their time dressed up to go and see off and welcome the President. ..one would be mistaken for thinking this is 1970 or 1985 UNIP one party rule dictatorship. Can’t the President be welcomed by the Chief Executive or Duty Manager at KKI Airport. You so blindly call yourselves a “Christian Nation” whatever that means…yet you want others to work on Sunday…really laughable. We are a Christian nation. We shall not bend to your illusions or to any Jewish and African hating mysogist like Ghandi was. Stop it and learn to appreciate good when good is presented. Jesus is Lord of the Sabath and we are his, as simple as that. *Mysoginist* spell check or not, we are a Christian nation. If one dislikes that, well it is not our problem. Israel is of the order of Jehovah, their Airports operate on Sunday, so can we. You are the main reason I encourage black people to read about self. Ba Jay Jay – Zambia is not in war situation and so the military can afford to perform ceremonial functions all the time – and we love seeing them smartly dressed like that. Probably what you say is that each Wing should have senior officers designated to perform this role instead of commanders. The army chiefs should look fit. Almost everyone is overweight. What type of army is this? Welcome back home sir and we are happy to see you! 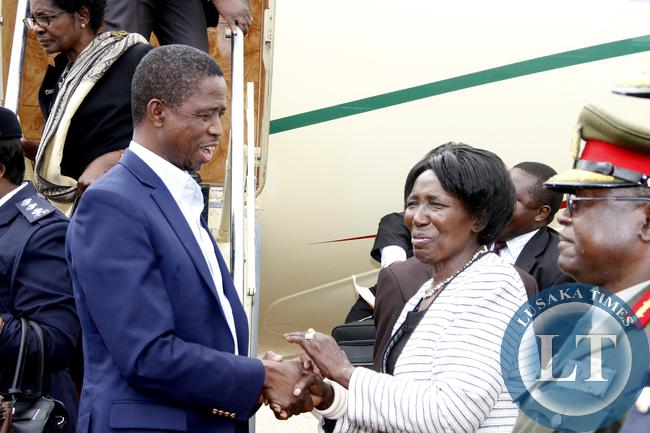 Edgar lungu why do you want to go for the holiday what work have you done. Whilst he was a Minister of Justice and Defence he took leave to go and campaign for Presidency now if he takes another leave in a space of two weeks it will be a bad start indeed. He is taking leave to go and plan and select the remaining members of his cabinet. What is the problem wth that? Welcome back my presido! You are so humble and down to earth. which humble, look at the body language. the man is not comfortable and confident as president of the country. maybe tabala belela but look at all the other presidents we have had. They walked tall and confident, which is ironical because edgar is the tallest president ever in zambia yet he walks short. Baliikumbata ba chagwa. The man lacks confidence in himself. Look at all his pictures from the time he was appointed president of zambia. Return of the President. May be we can start having some news. After the campaigns, we need news to keep the momentum. When EL talipo bonse abashala nibangwele. Not only did he not have a plan but he did have a cabinet as well, a football manager who knows he will be playing a game but does not have his starting 11, only Zambians can put up with such nonsense.With less than a week in office you go away for official duties, being a president in Africa should be the easiest jobs, have over for such a big job only takes minutes, Wow!!!!!!!!!!!!!!!!! Now i know why Africa is not developed. Meant to say, The hand over for such a big job taking only minutes. A true statesman who went to fulfill a necessary mission for our nation. Kudos Mr Lungu! teach the inexperienced how it’s done. Let’s make progress this year and finish off the projects started by the late His Excellency MCS curtailed by his untimely death. Peace and prosperity will come through this chosen one. True, dignified leader! go PF!!!!!!!!!!!!!!!!!!!!! (HH) cant stand seeing these beautiful pictures. I hear he’s vomiting every time he hears how much the people love humble Lungu. (HH) has never been a president in his life and has never sat in State House. The first lady should carry her own hand bag.its crazy for the woman bodygaurd to have 2 bags in her hand. So that the *chola girl* can have a job to do. Otherwise they spend time on fixing their wigs and tweez their eyebrows than worry about security. Utumawigi namafuta yakusweta tebusuma mwamwanakashi. …………………..*Utumawigi namafuta yakusweta tebusuma bwamwanakashi*……………………. “President HH arrives home from Ethiopia!” Sorry I am just thinking aloud from my base – Galu Watchers in Zambia! (HH) will never come so close to stealing the presidential vote again. I’m glad the system has been purged of thieves like Munkombwe, VJ, GBM, William Banda, Maureen Mwanawasa, Katele, Mutati and other backyard crooks. A privatization crook like (HH) will never set foot in State House, come 2016 it’s my man Wynter and the RP vs EL and the PF!! Leave HH alone, he’s not the topic of this posting. Discuss issues that are posted on the media. 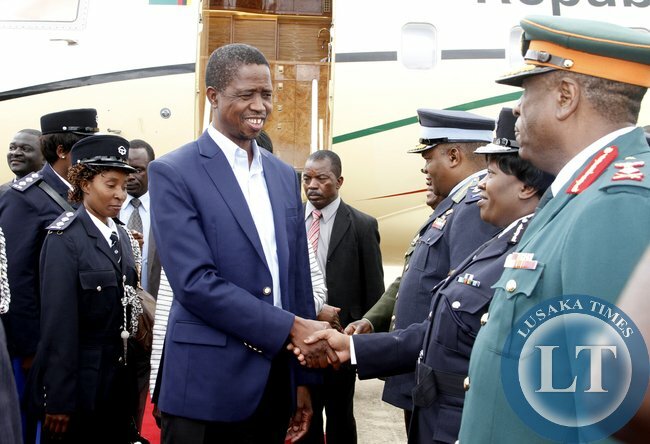 Welcome home Your Excellency Edgar C. Lungu, President of the Sovereign Republic of Zambia, President of All Zambians. Whether they all voted for you or not, what matters is that we did vote for you that is why you are there. While you were away Mr President, there were pockets of dissaffection by those who have failed to come to terms with the status quo, but just give then time, it will come to pass. As you complete your cabinet we hope you can consider this. There is need to consider splitting the Ministry of Mines and Energy. There are too many problems in the mining sector which the previous ministry has failed to handle. As the Mine unions have stated, there is need to appoint someone in that ministry who understands or is capable of understanding mining issues. And being the major Zambian industry, major foreign currency earner, major employer and major almost everything in Zambia, surely there is a case to have a ministry specifically to handle mining affairs: exploration, existing operations, expansion of mining activities, taxation policies, employment, and most importantly attracting and nurturing new mining investments, win-win basis of course! Of course by hiving off Mining from the existing ministry, there will be a windfall benefit of attention to the energy sector, which currently seems directionless, important as it is to the development of the country. If there is a specific problem that requires to be addressed with detailed attention, a specific ministry is justifiable by the savings and value addition such ministry will create for the country. Just like Hon Dr Simbyakula and his Justice Ministry will address the Constitution, an important element for Zambia’s development and peace. Because of knowledge of the rule of law, Lawyers makes good presidents. Remember Mwanawasa!! Ninani aposako amano…..konaulafye inpiya sha tax!